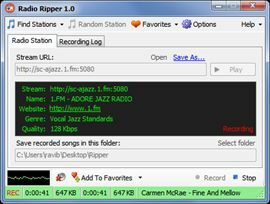 Radio Ripper lets you listen to thousands of radio stations located around the world for free. You can pick everything from jazz, rock, classical and country to new age, Bollywood and disco, it really is an enormous selection. 100% portable - will run off a USB stick. Recorded song files are properly named and tagged. Set optional recording limits for unattended recording. Easily find new radio stations.